It all started when Louis messaged me one day out of the blue. He wanted to know if I knew anyone travelling from Preston up towards the north east. “No” was the answer. But, thinking I might be able to help, I asked what was up. Turns out, there was a pouchie in Preston that needed moving to Sharon’s in Newcastle, and fast. I couldn’t get her there, but I had half of an explorer cage free, so offered to foster her until transport could be arranged. I went to meet Charlotte, Yena’s second owner, on the Saturday. Unfortunately she was moving and couldn’t take Yena with her. So we had the unenviable task of trying to get a scared, unhandled pouchie out of a small cat log, which she had wedged herself into. Luckily, we got her out, and Louis had sent me a video the night before on handling pouchies, so we were able to get her into a carrier. I took her home, and popped her into the cage I’d set up for her. I then left her to settle in. I have to admit I was scared; I have rehabilitated many fancy rats, but I’ve never owned a pouchie, and didn’t know what to expect. I also knew that Yena wasn’t very social. That was an understatement. She was terrified. She wouldn’t come out of her igloo. Clean out was a nightmare. I had to clean out one half of the cage, fill it up with fresh substrate, and kind of gently poke her over to that side while I cleaned out the other. Luckily, she’s intelligent enough to get used to this, and does it automatically now. 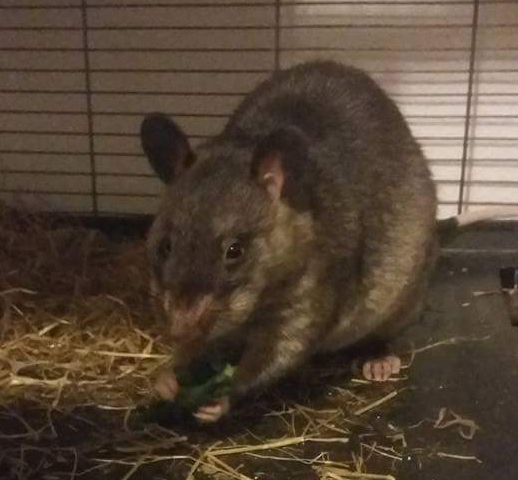 I fed her lots of nutritious and varied vegetables and fruit, and also a mix of dried food that I also fed to my fancy rats. I sat and talked to her for ages. Nothing. So I removed the igloo. That made it much, much worse. She curled into a little ball, trembled, shook and bruxed in fear. I kept this up for two weeks, thinking she would get used to it, and adapt. But eventually I couldn’t stand to see her so miserable, and gave her back the igloo. Since then, she’s been much happier. She’s uncurled and has let me stroke her. She’s only ever once tried to nip me, and that was because I tried to stroke her while she was eating a peach, and wanted to be left alone. It was at this point that I realized she’d been making small, but definite steps of progress, and had wormed her way into our hearts. She’s so beautiful; she has a head like a tiny kangaroo, and her fur is sleek and shiny, and a gorgeous colour. I feel so bad for her that she can’t live like a normal pouchie yet. I knew at that point that I didn’t want her to go anywhere. After speaking to my husband, it turned out that he didn’t want her to go, either. So we became failed fosterers, and successful adopters. There have been a lot of things to learn. She doesn’t really drink that much water. I was a little worried about that until I found out that she gets most of her fluid from her food intake. I panicked about a funny noise she was making. I was convinced she had a chest infection and was going to rush her to the vet. Then I realized she was just vocalizing. Her favourite fruit is banana, Clementine and strawberry. I can hold them out to her, and she will pounce on them and emit a high squeaking noise. The first time that happened, I was terrified, convinced she was ill. But no, she was just happy I was feeding her the food she liked the most. Now, we have a nice routine. I get in from work, and get her food ready. I take it in to her and talk to her while feeding her fruit and veg. She pounces on her favourites and squeaks at me. Then I have my tea, and go back and speak to her and stroke her for a while. If she gets fed up, she will turn around and glare at me, and I know to back off. Ultimately, my aim will be to socialise her enough that she will come out of the cage and play with me. I know that might take a very long time, or might never happen at all. But I’m damned well going to keep trying. She deserves that much.